Pietro Mascagni (December 7, 1863 – August 2, 1945) was an Italian composer, notably known for his operas. He enjoyed immense success during his lifetime, both as a composer and conductor of his own and other people's music. He also composed a Kyrie for three male voices, an Ave Maria and a Pater Noster for soprano and string quintet. He decided to re-elaborate this material into a Messa di Gloria for soloists, chorus and orchestra. The first performance was given in April 1888 in the church of Sant'Antonio, being a total and undisputed success. 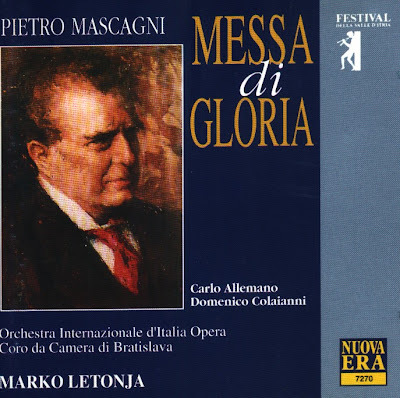 Feeling, affection, sweetness and at the same time vigour in meldoy: these are the characteristics that are constantly recognised in Mascagni's Mass. The Compact Disc was released by Nuova Era, 1996, (DDD). Nuova Era 7270.